Who says sangria is only a summertime drink? 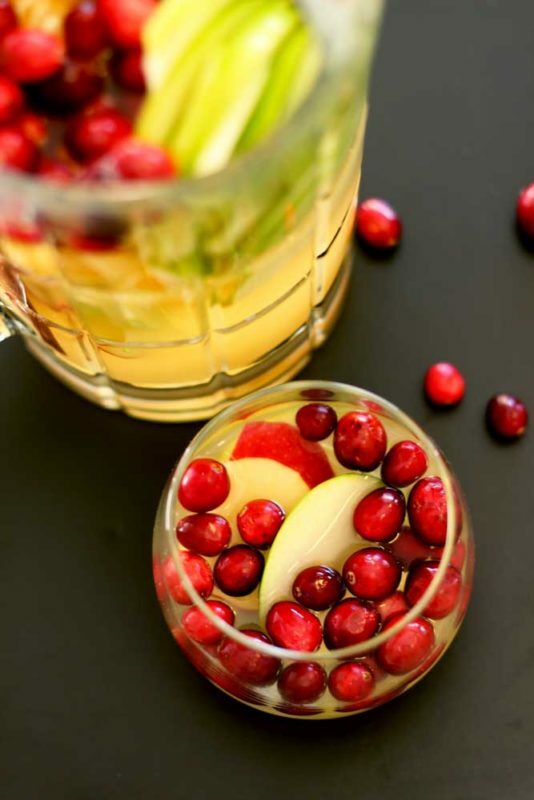 This Cinnamon Apple White Sangria is full of wonderful winter flavors! From the crisp tartness of the apples and cranberries to the citrus of the orange mixed with the sweet and smooth velvety taste of coconut, you’re going to love every drop of this beverage! This is a sponsored post written by me on behalf of Amy and Brian Naturals. All opinions are entirely my own. Ok, so I’ve fallen in love with something new and I just have to share! I think we all have seen and heard the nutritional benefits around using coconut oil and drinking coconut water. That information is everywhere these days! I’m all about nutritional value so I was extremely excited when I discovered Amy and Brian Natural Coconut Water! Hand selected from the finest and youngest coconuts and those coconuts are not treated with any chemicals or pesticides! Oh my goodness…so yummy! You can find Amy and Brian Naturals Coconut Water at major retailers nationwide. I found their coconut water at Walmart and you can also find them on Amazon. Find it on Amazon Here! I’ve had all four flavors and they are all amazing, but I want to focus on the Coconut Water with Cinnamon for a minute. You guys…this Coconut Water with Cinnamon is so fantastic for the winter season right now! I’m telling you, I’m adding this Coconut Water with Cinnamon to so many things! I’m in love with the taste! because of the slight tent of cinnamon flavor. It’s not overwhelming at all. It has a subtle and smooth taste. I’ve made several different things with these coconut waters, but my absolute favorite thing I’ve made so far is with the Cinnamon Coconut Water is a Cinnamon Apple White Sangria. Yep, I went there…I made a yummy adult beverage that is PERFECT for the holiday season! I host like crazy at my house because everyone knows how much I love to cook and entertain, but I’ll be forthcoming for a minute…I don’t serve a lot of specialty adult beverages. I’ve just never stopped long enough to creatively pull an adult beverage together. I know…that’s kinda sad. 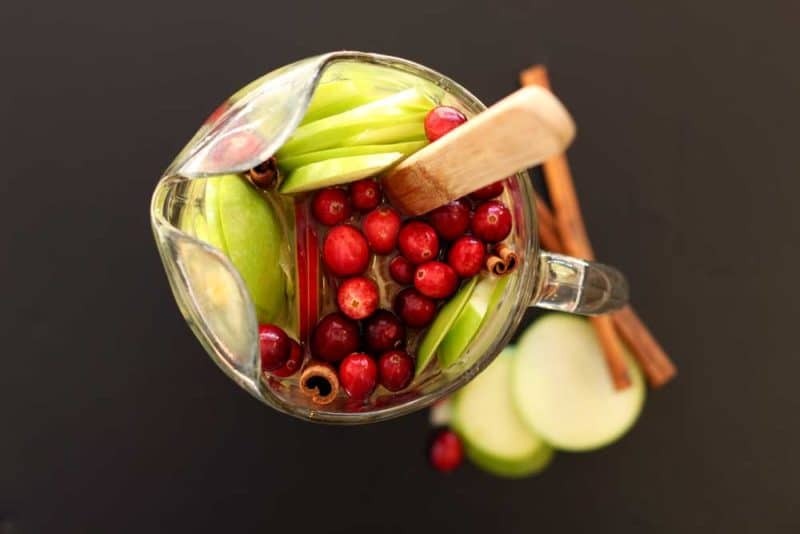 But when I started drinking this Coconut Water with Cinnamon, all these ingredients for this Cinnamon Apple Winter Sangria just came together and let me tell you….it’s fabulous! This drink will literally take you about 7 minutes to make. It’s super fast to throw together and after you cut your fresh fruit and mix it all together with the liquid ingredients, you’ll want to chill your Cinnamon Apple White Sangria for at least 2 hours before you serve. This ensures all those wonderful natural tastes from your fruit mix together with the Coconut Water with Cinnamon and all the other liquids in this beverage. I will tell you that I did cheat and I went ahead and filled a glass with ice and poured myself a glass. I just couldn’t wait! It was so fantastic and full of flavor! Right after I did that though, I chilled my glass pitcher in the refrigerator for 2 hours and it was ready to serve my guests. Guys…this one is naturally Gluten Free and I LOVE that!! Amy and Brian Naturals Coconut Water contain only natural ingredients! What a fantastic drink for the upcoming holiday season! Although, I could drink this beverage year round. It’s that good! Happy drinks with this one! You’re going to love it!! Oh, and by the way…I have other yummy adult beverages here at Recipes Worth Repeating! Make sure you check out my Green Apple Martini and my Singapore Sling! Who says sangria is only a summertime drink? This Cinnamon Apple White Sangria is full of wonderful winter flavors! 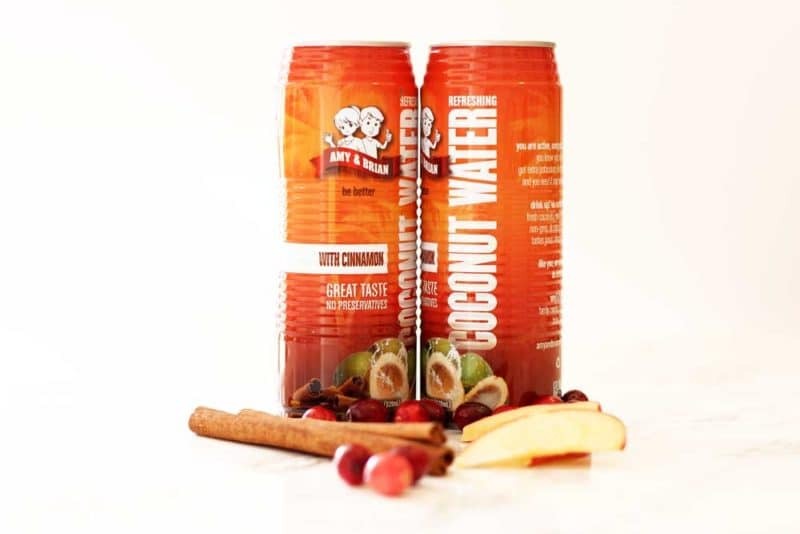 From the crisp tartness of the apples and cranberries to the citrus of the orange mixed with the sweet and smooth velvety taste of coconut, you're going to love every drop of this beverage! Wash all fruit. Peel the orange. Leave the peeling on the apples. Thinly slice the apples and orange. Put aside in a bowl. In a large pitcher, pour in Amy and Brian Naturals Coconut Water with Cinnamon, white wine, orange liqueur and stir well. Add the 3 cinnamon sticks to the pitcher of liquid and gently stir. 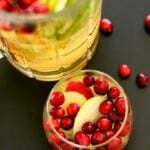 Place the sliced orange, apples and fresh whole cranberries in the pitcher of liquid. Pour in the sparkling water and mix well. 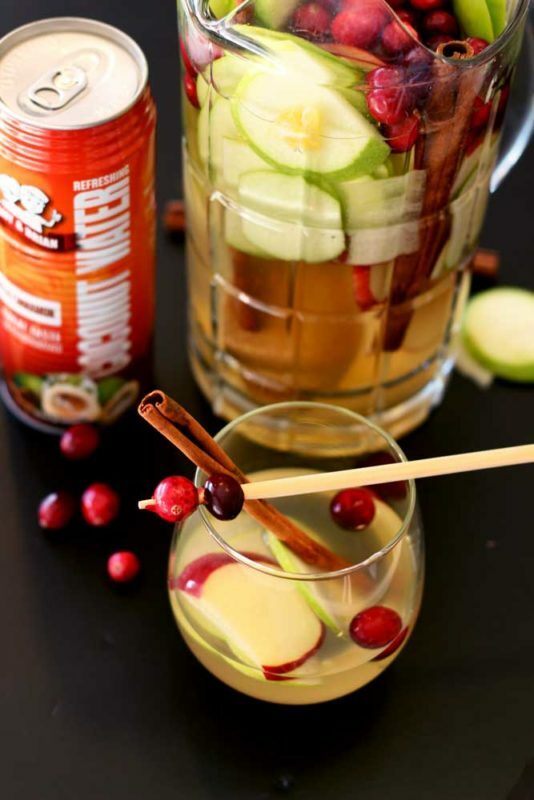 Pin this Cinnamon Apple White Sangria to your favorite drink board on Pinterest! Got to try this, though I think I might prefer the raspberries variation you mentioned in the comments to cranberries. I might try both though if i can get a hold of some cranberries. This type of drink is something I would really enjoy I think. The raspberries will add a really nice flavor to this drink so definately try those if you can’t get your hands on cranberries! this looks so refreshing! I love sangria any time of the year!